Lethal Lace has gotten a lot of positive press over the last few years. It’s been hailed as a flexible, feminine solution to the concealed carry problem. Fans profess their love for its ability to work with a wide range of guns in almost every carry position, while remaining comfortable and without a “tactical” look. Having concealed a gun for nearly a decade and landing on a fairly conventional carry method, I was curious to see what the buzz was about. I bought one of their standard regular sized universal wraps to try, evaluating it against my experience as a concealed carrier and instructor. I absolutely cannot recommend this product. In fact, I would encourage anybody currently using the Lethal Lace product to stop using it immediately and replace it with a safer option right away. The basic functions of a holster are to hold a handgun securely including protecting the trigger, conceal the handgun comfortably, and keep the handgun in a position that allows it to be accessed and used if and when necessary. Lethal Lace fails every one of these criteria to varying degrees. Editor’s Update (Oct 2018): The founder of Lethal Lace wrote a reply on their blog to this review. 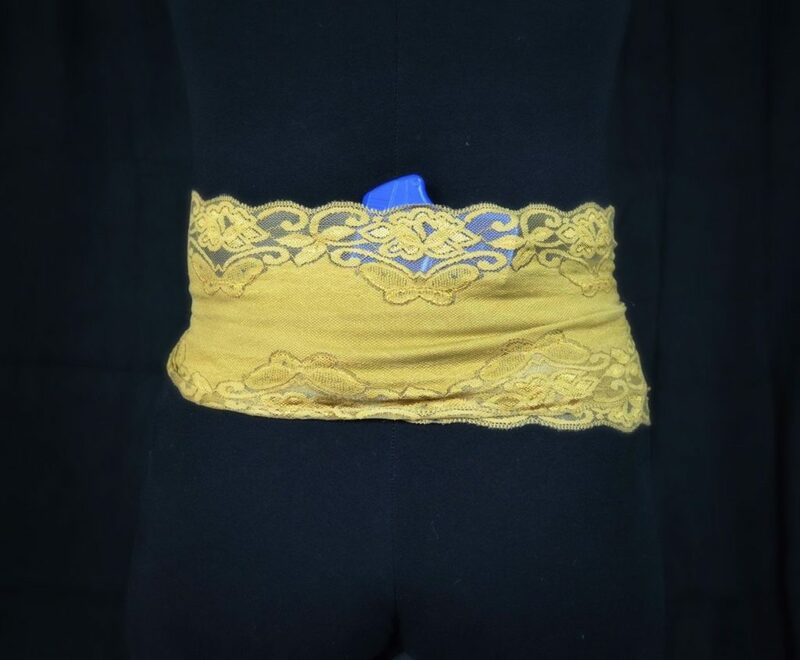 If you aren’t familiar with Lethal Lace, the product is a length of thin, stretchy lace with two, two-layer pockets at one end created by additional layers of the fabric. Two alligator-style suspender clips are sewn on; one clip is at the bottom of the pockets and the other is at the far end away from the pockets. It comes with a small rectangle of neoprene. The idea is that you insert your gun into the pocket, hold it in place on your body, then stretch and wind the lace around and around. The clip at the end is then attached to wherever on the wrap is available, and the clip under the pockets is pulled up and attached to the wrap as well. The neoprene is intended to go in the pocket between the gun and your body, to help cushion your body from the hard edges of the gun. Several of the positions recommended by Lethal Lace on their website. It’s available in three different lengths: 56, 92, and 128 inches. The shorter wrap is generally intended for use in the ankle, calf, and thigh positions, and the longer wrap for all positions on larger wearers. To test it, I used blue gun versions of the Smith & Wesson M&P full size, the SIG SAUER P320 Subcompact, and the Kahr P9. Since Lethal Lace claims to work for any handgun, I wanted to try the full range of sizes though I did focus on the P320 and P9 since they are closer to the types of pistols most women carry. 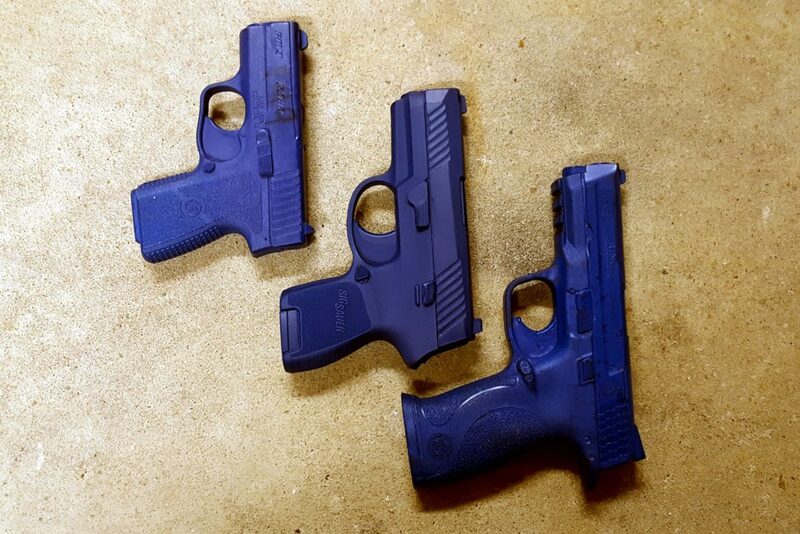 These are the actual blue guns used to test the Lethal Lace for this article. I tried each of the carry positions illustrated on the Lethal Lace packaging using appropriately-sized blue guns for those positions. After securing the wrap, I moved around to simulate what an active person might expect in everyday life – sitting down, standing up, bending over, kneeling, a short run like you would make to catch a bus. Blue gun testing for alternative carry methods is common as a safety measure. My plan was to follow with firearms and weighted dummy rounds so that they would have the same weight distribution as a loaded live firearm. As I’ll explain below, I did not proceed to testing with real firearms due to the results of my blue gun experiences. One of the most important jobs of a holster is to protect the trigger. When you’re carrying your gun, the last thing you want is for something to make its way into the trigger guard and cause an unintentional discharge. That could be your finger when you’re putting the holster on, taking it off, or adjusting it, or it could be something pointy in your environment – the corner of a table or box, perhaps. The fabric used in the Lethal Lace product is so thin that even when wrapped tightly multiple times over the firearm, the trigger remains fully able to be pressed. And that’s assuming that the wrapping process or the wearer’s movements have not resulted in the trigger guard no longer being covered by even that much. Even when the lace started out over the trigger guard, I found that little movement was required for the gun to start popping out enough for the trigger to be fully accessible. Get yourself a holster that securely covers the trigger guard. That’s a holster’s main job, afterall. Given the steps required to wear Lethal Lace, there’s a danger that the trigger could be accidentally pressed while putting the product on. Normally, a pistol should be held in a full firing grip with the index finger indexed as high as possible along the slide or cylinder. It’s difficult to do that when holding a gun flat against your body, in preparation for wrapping the rest of the Lethal Lace around the body to secure it in place, or while trying to keep it in place while taking the Lethal Lace off. The distraction of maneuvering the lace into and out of position can cause two problems. Even with careful attention and my strongly-ingrained handling skills (I once tripped and launched several feet across a range, landing face first in the dirt, while trying to run during a match, and maintained both trigger finger and muzzle discipline), my finger slipped into the trigger guard several times while attempting to wind and unwind the Lethal Lace around my body. Even well-practiced, the Lethal Lace is unwieldy to put on, with a constant danger of dropping the gun or pressing the trigger unintentionally. And sometimes, I just dropped the end of the Lethal Lace with the gun inside entirely, particularly when working with carry positions behind my strong-side hip or under my weak-side arm. This was especially an issue when trying to hang on to the gun while removing layers of fabric from over it. 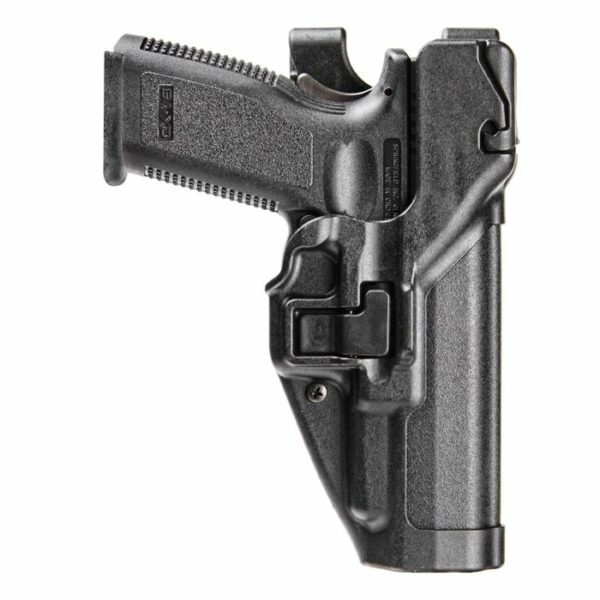 The problem can be alleviated by drawing the pistol before taking the product off, but that does require additional administrative gun-handling and a safe and secure place to put the pistol at that time. While most modern pistols are drop-safe and won’t fire if they hit the ground, the impact can negatively affect the drop safety mechanisms and cause the pistol to become unsafe in a future drop. This is one reason I did not test the Lethal Lace with a real firearm. Another is because in almost every carry position I tried, I experienced multiple failures of the gun being retained by the Lethal Lace. In fact, I could make all three of my blue guns pop out nearly on command when carrying in the popular appendix position. All I had to do was sit down or bend over at the waist and stand up a few times. 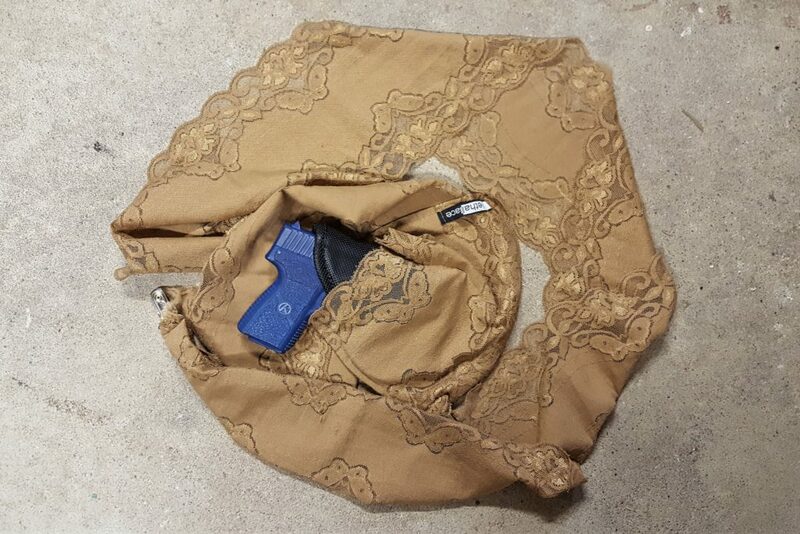 Lethal Lace is incapable of properly retaining a handgun during everyday movement. Most disturbingly, the guns’ muzzles pointed directly into my abdomen, then upwards, as they started falling out, creating a distinct risk of a gun being fired into my torso, including my chest cavity, should the trigger catch on anything as the gun became dislodged or if I had tried to stop the fall. It is a vital safety practice to not to try to grab a falling gun, but it’s a difficult reflex to ignore, and potentially deadly in this situation. The manufacturer sells Sticky Holsters as an option to use with the Lethal Lace. They’re soft holsters that you jam your gun into and that are intended to stay in place between your skin and fabric, or between layers of fabric, due to their “sticky,” high friction exterior. These types of holsters in general can be problematic both with retaining the gun and staying in place. However, given that the fabric wraps of the Lethal Lace go directly around the body and can create added pressure around the holster to help keep the gun in place both inside the holster and on the body, I decided to try the Lethal Lace with a similar style of holster. The sticky-style holster was tested inside the Lethal Lace pocket. While doing so, I found that there was in fact better trigger protection. It was not as easy to lose the gun out of the Lethal Lace, though it would still occur with regularity. When it happened, the gun would normally fall while still inside the soft holster. Dropping a gun is never good, but at least with one of these soft holsters, the gun would be less likely to have the trigger exposed while falling. Retention in soft holsters of this type is not always reliable in any case, so this solution does not fix the safety issues inherent in the Lethal Lace design. Finally, it is impossible to safely reholster into a Lethal Lace, as is the case with the vast majority of these types of products that do not have a reinforced opening where the gun is inserted. The only way to do so is to remove the wrap entirely and start over again. Aside from any considerations on whether it would be necessary to reholster after a defensive encounter, the inability to reholster easily makes it very time-consuming to get any meaningful sort of safe practice or stress-testing with the device. The ability of a holster to comfortably and effectively conceal a handgun should never override safety issues. A review would be incomplete without looking at those factors, though, because they are key to the success of a concealed carry solution. As I mentioned above, I tried the Lethal Lace in a number of positions. After experimenting a few times, the twisting and turning required to get the wrap on while holding my gun in place became manageable and the product itself felt reasonably comfortable when I first put it on. Balancing sufficient tension of the fabric against being able to reach the alligator clip at the end to attach it could be awkward in certain positions, especially around the torso. The length of the product was unwieldy at times. 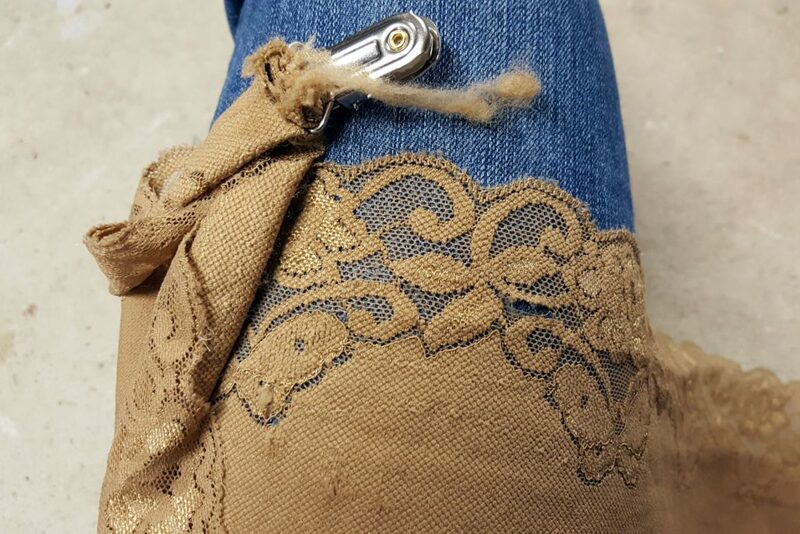 In addition, if the lace was pulled too tightly, the clip at the end sometimes pulled itself loose. 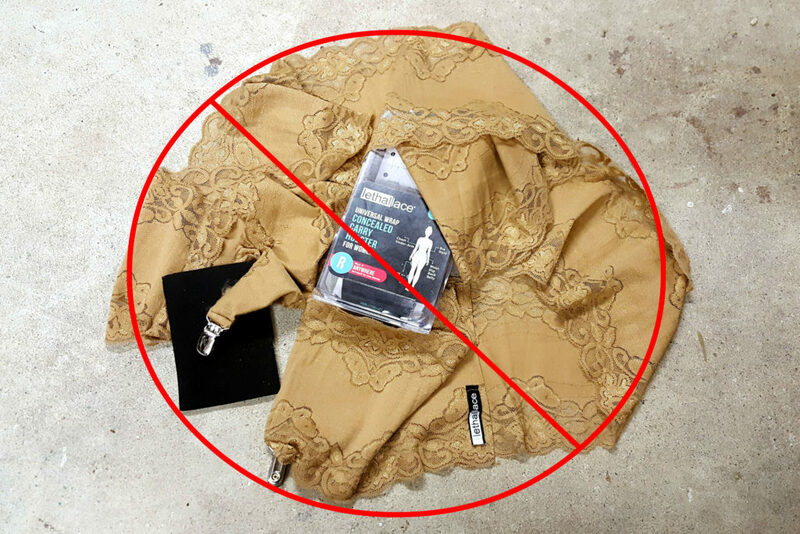 This video illustrates several of the comfort and concealment issues the author found while testing the Lethal Lace product. I wrapped the Lethal Lace across the entire slide of the gun from muzzle to grip, covering the trigger guard as much as possible, and keeping the fabric as flat as possible. It was tricky wrapping the lace tightly enough to support the gun, even with using the clip under the gun pocket to create a small sling to hold the gun instead of relying entirely on compression of the wrap against the body. Sometimes, there was sagging or the grip of the gun would stick out and away from the body if I didn’t get the tension just right. The grip of a holstered gun sticking out is a common problem. In more standard holsters, that problem is often addressed by adding a wing or bump over or next to the (protected) trigger guard. With the Lethal Lace, the only solution is to wrap tighter over that area. In some attempts, wrapping too tightly around the muzzle end forced the entire grip to tip outwards, not just the bottom end. One of the suggestions to deal with those retention and concealment issues is to wrap the fabric over the grip as well. This requires great care to avoid with very small guns in any case, as the pockets in the product are the full width of the lace in order to support a greater variety of firearms. It is, however, a solution that results in the gun being almost completely inaccessible. The inability to get a full firing grip on a concealed pistol makes it difficult to impossible to draw under the pressure of an attack. Planning to tuck the wrap behind the grip in a high-risk situation is impractical and unrealistic. This image from Lethal Lace illustrates covering the grip to increase concealment. The reader should be aware that this gun position, directly over the spine, is extremely unsafe regardless of carry method used. All this assumes that the Lethal Lace stays exactly as it is initially put on. My experience found that I could not expect that to be the case. 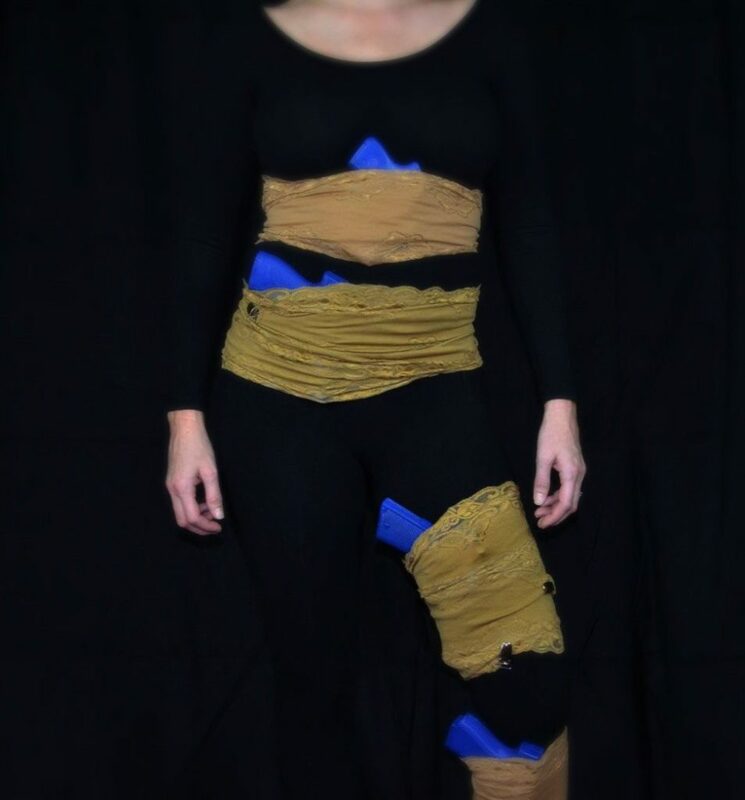 For carry positions around the torso, the fabric began rolling into a narrower bad almost as soon as I started moving. Without the wider support of the full width of the Lethal Lace, larger guns became uncomfortably heavy quickly. In those and other carry positions, the entire product would often start shifting and loosening, a combination of the wrap wanting to migrate to the nearest narrow part of my body, the weight of my blue gun, the stretchiness of the lace, and the clip not always staying in place. I imagine this effect would become more pronounced with real guns because of the extra weight. Of additional concern, the fabric of the product began visibly deteriorating through just the wear-testing for this article. The fix for this issue is to adjust the wrap or take it off and put it back on. I was not able to discover a way to effectively adjust the product while wearing it, as I found I needed to unwind it almost entirely in order to add more tension by stretching out the lace more. The length of the Lethal Lace, at least in the “Regular” size I used, was difficult to manage in enclosed spaces like public bathroom stalls. I do not believe it to be practical to expect to be able to adjust the Lethal Lace as often as would be necessary based on my testing. As I stated up front, I emphatically do not recommend Lethal Lace. It is both unsafe and ineffective. Soft and universal holsters are often problematic, and the Lethal Lace design compounds the issues found in those products. There are far better options for on-body carry, both those that do and don’t require a belt (see our Best Concealed Carry Holsters and Best Ways to Conceal Carry for Woman). If you’re a Lethal Lace user, I encourage you to explore those products and make a switch. I completely agree. This method of carrying is foolish and dangerous. Everything you said about it is straight up true. It is the most “unsecure” holster I have ever tried and I’ve tried a lot of them because I am only five feer tall and printing is almost impossible to avoid. I have a Smith and Wesson Bodyguard and even that little bitty weapon was extremely unsecure. 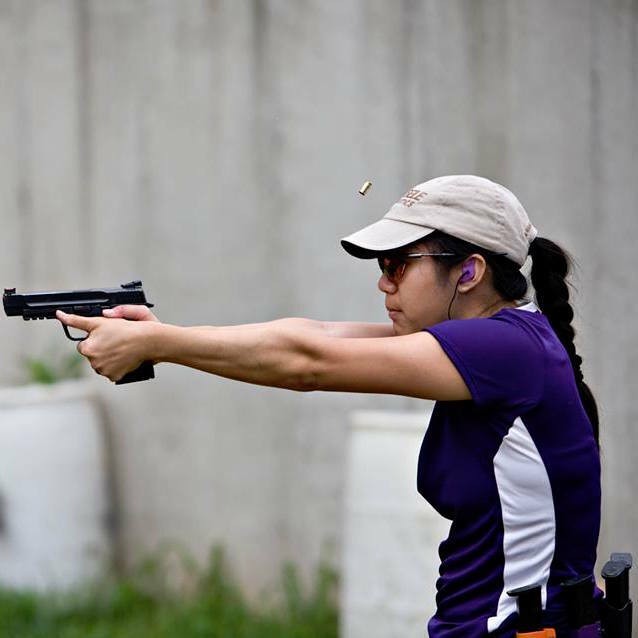 While, I am not a woman, I do know women who are very interested in getting into the gun world. For the uninitiated, Lethal Lace could be very appealing to them because of how it “looks”. Its not often I find such a thorough, unbiased review of something the reviewer ultimately do not recommend. Thank you, Annette! Yup, Annette did an awesome job!